A half-pound of strawberries covered in Suzin L. chocolate. Pre-Orders Open through May 17th. Payments for preorders will be processed May 17th. Strawberries can be picked up during store hours May 18th. Smooth creamy peanut butter centers surrounded by smooth peanut butter melt-away. 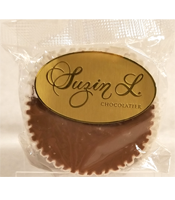 Please note that Suzin L. products are made on equipment that also processes peanuts, tree nuts, milk, eggs, and wheat. We recommend stopping by the store to view and or purchase food items from our Locally Focused vendors!